Base with pop bottle attached. 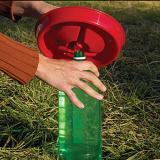 Easy-to-use, handy, low cost waterer. Note: This is the base only. The 20 oz and 2 liter bottles are not included. Good starter waterer for a few birds. Simply fill a plastic bottle (20 oz for the small base or 2 liter size to fit the large base) with water, insert the base into the bottle and flip it upright. Use this all natural additive to keep your poultry and livestock waterer systems clean. A natural source of energy and nutrients. Produces healthier, more productive chickens, turkeys, ducks and guineas. Lifts poultry feeders and waterers away from the bedding in chick brooder pens. Build a safe, secure chick brooder using modular brooder panels. Quick to assemble with disposable and reusable options. 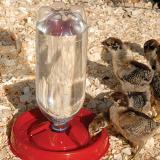 Rugged and reliable heat lamp used to warm lambs, goat kids, chickens or for any animal that is sick or cold. Uses standard or infrared heat bulbs. Outlet turns on at temperatures less than 35°F and off at 45°F. 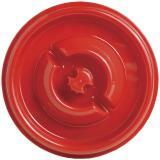 Use with heat lamps, tank de-icers and engine block heaters to save energy. Smooth glass and pressed glass (PAR) infrared bulbs that can be used in heat lamps. For hanging heat lamps above brooders. Adjustable height allows user to control the surface temperature of the brooder floor. Number of reviews: 11 customers reviewed this product. Recommended: 11 out of 11 said they would recommend this product to a friend. The last ones I bought lasted over 5 years, sun finally got to them. 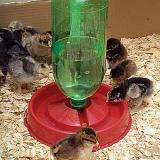 I bought the small waterer.This is great for new chicks. Just their size. 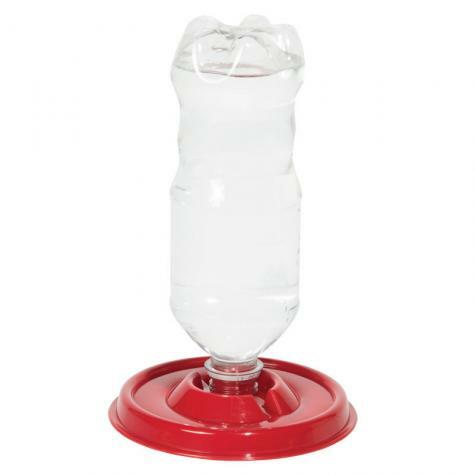 It is so easy to use with a minimum of spilt water and it's lightweight, yet stable. So much better than the waterers that use the canning jars. And you certainly can't beat the price. I saw this waterer and thought it would be a way to supply ice water to my small pens. A frozen water bottle is the perfect solution. Attached to this base the water thaws and provides cold water on hot summer days. Such a simple, inexpensive PERFECT solution to watering. I have both the small and large waterer bases. My hens are big so prefer the larger drinking trough, but have no problems using the smaller either. They are much more stable than anticipated!